We are big on green smoothies in our house. We usually make them once or twice a day at least and I load them full of healthy, leafy greens and veggies. So even if my kids don’t want to finish the veggies on their plate at dinner I do not worry because they already have two to three servings in their bodies already thanks to green smoothies. But since we are trying to get away from eating meat for environmental and health reasons, I find the need to get even more protein rich greens into their diet every day. With summer around the corner it seemed a no brainer to accomplish this with delicious warm weather treats. Our green smoothies become green Popsicles in just a few hours! The prinicple is the same, just mix leafy greens and veggies with fruit in a blender and pour the mixture into popsicle molds. For added sweetness you can use a bit of raw agave nectar but a ripe banana is usually sufficient. My kids love these so much they go through a dozen every two days so obviously they are pretty darn tasty. The fact that they are healthy too is a big bonus. Because so many plastics have nasty ingredients that can leach, I also make sure to use BPA Free Popsicle molds. We like the stars and rockets Tovolo popsicle molds. 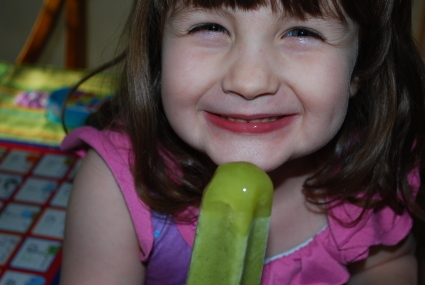 Here is an easy green Popsicle recipe that my kids love. I am sure yours will too. Blend until smooth and pour into molds. We’ve been making smoothie popsicles too. The kids love them and I don’t have to worry about what has gone into them. We use honey for sweetener. The most memorable time was the day I told the kids that yes, they could have a smoothie popsicle for breakfast. Why not? They’d had that same smoothie with breakfast the day before! My friend was recently telling me about how she’s started making smoothies and popsicles for her kids incorporating kale and spinach. Her kids loved them and are always asking for them. Think we’ll start doing it too! I would never have thought of adding spinach to popsicles — this is awesome. is the spinach raw or cooked? awesome! can’t wait to try these out! Really, Bob? I wonder what went wrong. How much spinach did you use? (I wonder if you should start with a little less.) Also, what did you use for sweetener? I’m going to try this recipe as my son simply refuses to eat his veggies!